Mixed vegetables wrapped in filo pastry. 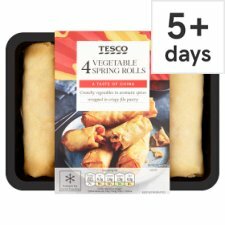 A take away favourite, why not try our Tesco Vegetable Spring Rolls this weekend. Sweet vegetables are cooked with oriental spices and wrapped in crisp pastry. Crunchy vegetables in aromatic spices wrapped in crispy filo pastry. Vegetables (45%), Water, Wheat Flour, Palm Oil, Rice Flour, Tapioca Starch, Sugar, Ginger, Cornflour, Garlic, Salt, Plum Purée, Sesame Oil, Soya Bean, Rice Vinegar, Fructose Syrup, White Pepper, Dried Red Pepper, Roasted Orange Peel, Black Sesame Seed, White Sesame Seed, Japanese Pepper, Seaweed, Ginger Powder. Vegetables Contain: Carrot, Red Pepper, Cabbage, Babycorn, Spring Onion, Yam Bean, Bean Sprouts, Water Chestnut. Place on a baking tray in the centre of a pre-heated oven for 22-24 minutes (from chilled). Place on a baking tray in the centre of a pre-heated oven for 24-26 minutes (from frozen).